Pics.io takes a pride in supporting a wide variety of file formats including a whole range of video file formats. 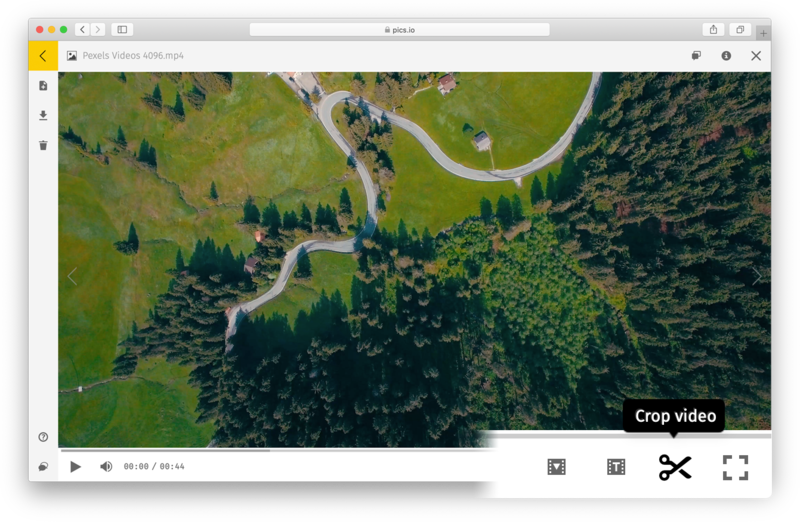 Pics.io has a powerful multiformat video player that allows you to play your video files and perform basic manipulations with them without leaving the app. Once you open your video file in Pics.io, you can see the timeline. The loading progress bar shows how far your video is through the loading process. If you place your mouse cursor on any place of the video timeline, you will see its timing, and that allows you easily find a place you need. To pause and resume playback process, you can click “play” button in the left corner below. Or you can merely click one time on the screen. “scissors” button - it allows you to cut your video files in Pics.io. To make this process easier, you can see the screenshots and the timing of the video piece you’re going to cut. full screen button - alternatively, you can to do the same with a double click on the screen. how to discuss your video files with your teammates with the help of Timestamp markers and Areas of Interest. NB Currently Pics.io video player can play the following video file formats: mp4, m4v, webm, quicktime (mov). As for other video files, you can upload and manage them in Pics.io, i.e. structure them in catalogs, attach keywords, leave comments, and edit metadata. In case you need to share your video files outside Pics.io, you may use a Lumière template to create a website.